Since DinoBoy starts primary school its a constant battle every evening with him to get him to unpack his school bag, bring out the spelling books for me to sign, school's letters to parents etc. When I saw the chore charts in Meaningful Mama's post, immediately I know this will be a solution for us! Today while DinoBoy visit Great Grandma with DinoPapa, I decided to sit down and try to make the chart. 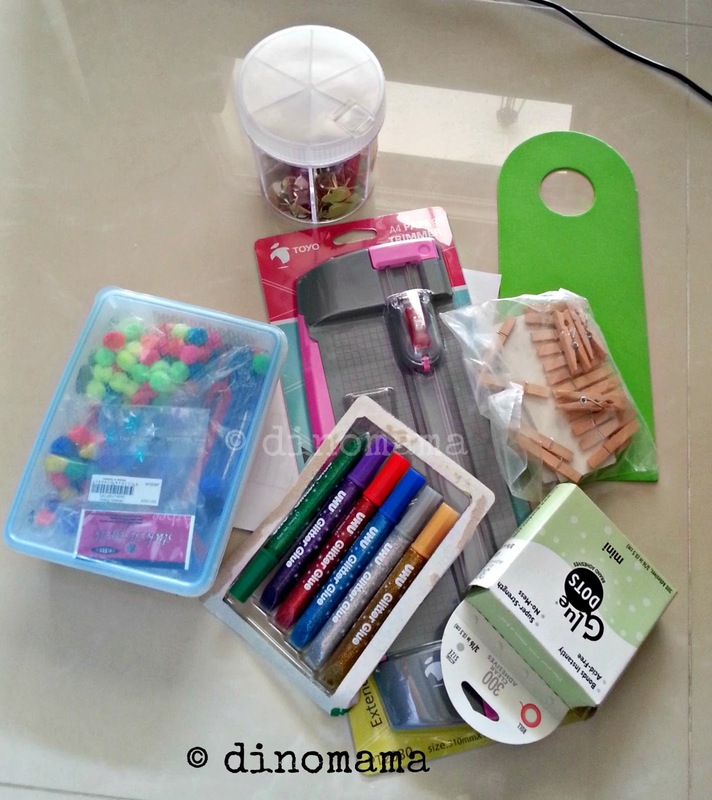 This is when I am really glad that I hoard all the art & craft supplies, I simply just gather those that I have and try to make it. 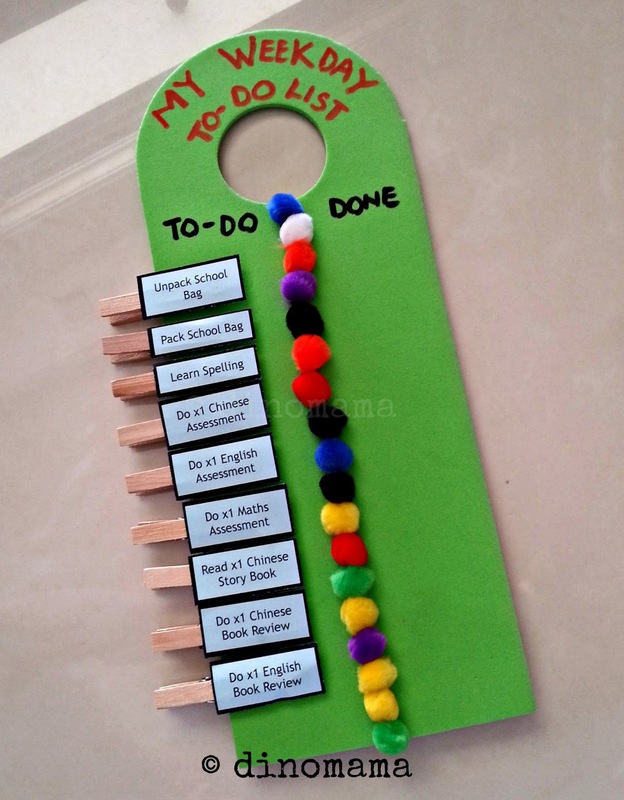 I list out the things I want him to do on most weekday evenings, cut them out and use mini glue dots to stick them to the mini pegs. 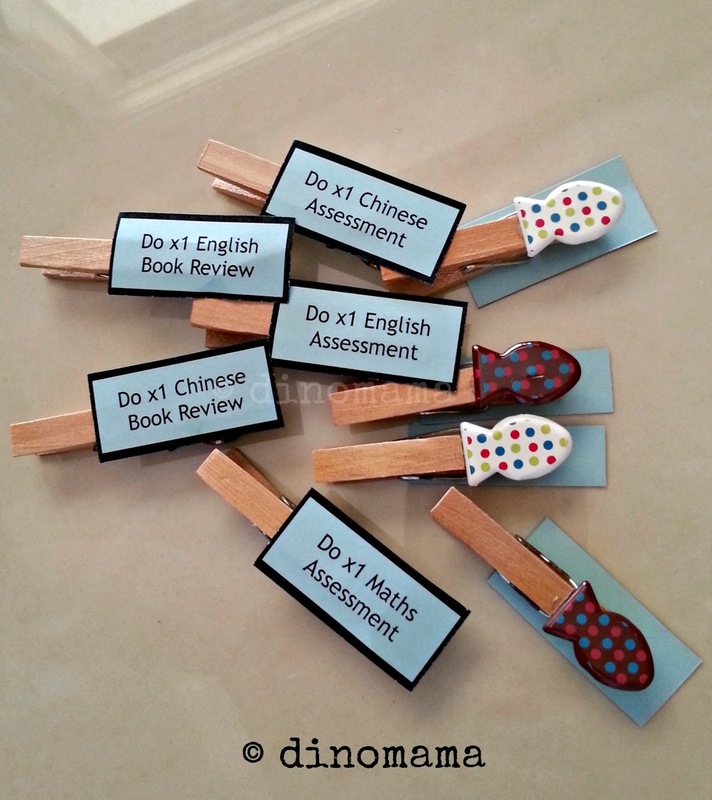 At the back I used the leftover colorful fish shaped scrapping pins, stuck them on to the mini pegs. I used a leftover foam door hanger as the board, by then DinoBoy came home and I got him to stick the mini pom-poms in the centre to divide them into "To-Do" and "Done" sections. I named his chart My Weekday To-Do List. Every time he finished the task, he will move the mini peg from "To-Do' to "Done", flipping the mini peg over to show the colorful fish. We will be using this next week, I am keeping my fingers crossed that this will work and no more arguments or battle in the evening. Brilliant idea, my weeks seem to be quite similar week in week out! I think for adults its mostly the same, for kids there are always some extra stuffs to do OR for the parents to help them to do. It's always a pleasure to visit your blog, Dino family! I get some great life management skills here. Thanks for another great post. Thanks for visiting again Deanna~ I am glad that you find my posts interesting and of some use to you. Thank you so much for stopping by my post...and I'm so glad I visited yours! You are fantastic! How creative...I love this chart...I am going to share it with my daughter who has an almost 5 year old son...I think this will be PERFECT!